You might think that a mostly-online graduate program would be impersonal. 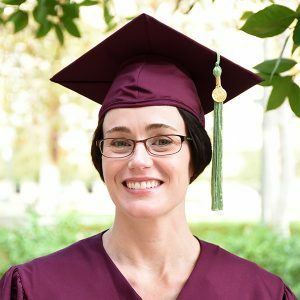 But, as Arizona State University alumna Julie Hopwood tells it, that’s far from the case with the Executive Master of Sustainability Leadership from the School of Sustainability. As she described in her Q&A below, Hopwood was impressed with the emphasis on both personal and professional development throughout the one-year program. Plus, she became quite close with her cohort and still talks to them regularly. “Whether we were seeking professional clarification, direction and impact in our current positions, immediate career advancement, transition to a new industry and/or the elusive dream of combining our personal and professional passions, I truly believe that my fellow cohort members and I graduated from the EMSL program feeling that our mission was, and can always be, accomplished,” Hopwood said. In her Q&A, Hopwood — who is currently the associate vice president for business and auxiliary services at Ball State University, Indiana — discussed how she learned and grew as a sustainability leader through the EMSL. Question: What was your “aha” moment when you realized you wanted to study sustainability? Answer: In 2011, I was living and working in Maine when I discovered an ASU recruitment video. As a public higher education professional, I was inspired by ASU’s powerful message and transformative vision. For me, ASU had articulated that every single thing we do to create positive and lasting change falls under the umbrella of sustainability: social, environmental and economic. Q: Why did you choose the EMSL? A: From the moment I reached out, the EMSL program advisor and faculty were extremely helpful and informative. They explained their intentional and strategic approach to creating a small cohort of professionals from diverse backgrounds and industries to experience a transformative personal and professional journey together. They not only addressed my concerns and apprehension regarding a graduate hybrid experience, they opened my eyes to the advantages of this approach to graduate education. Beginning with the week-long in person EMSL orientation and boot camp with our faculty and cohort, to our weekly online lectures, discussion boards, interactive guest speaker sessions, and detailed personal feedback from our professors, to our intensive week in Amsterdam working hand in hand with representatives and organizations from both the private and public sector, to our final week-long in person capstone presentations, I was repeatedly taken aback with the amount of planning and preparation, tailored curriculum and programming, and genuine care that went into ensuring that each cohort member was fully embraced in an inclusive and challenging learning environment. Q: Were there any particular classes or nuggets of information that really stuck with you or inspired you? A: I particularly enjoyed the EMSL Sustainability Leadership thread. As the central focus of the EMSL program, our “internal development as sustainability leaders” required each cohort member to create a foundational strategic planning document that established a personal leadership development plan based on our own strengths and weaknesses and our chosen leadership style. Assessing and reflecting on our current status as leaders through the lens of sustainability was an empowering year-long exercise compelling each of us to evaluate our own paths forward, as well as to clearly define the type of authentic leadership and organizations that we will intentionally choose to create and work with in the future. Q: How did you balance your classes with your job? A: I think it’s likely that most professionals are highly skilled at time management by the time they seek professional development in the form of executive education. That was certainly my experience with my EMSL cohort members. For me, the challenge was to find executive education that bridges the gap between personal and professional development and competing obligations. The School of Sustainability has definitely hit that sweet spot with the EMSL program. I personally looked forward to the lectures, guest speakers, readings, assignments and discussions each week without much guilt or distraction because I also knew that each exercise had an immediate and direct potential impact. The EMSL program, as executive education, is thoughtfully and skillfully designed to act as a type of quasi-consultant firm to help you focus, refine and renew your professional performance and trajectory. As a result, I was able to take the time for myself, and immediately offer those benefits to my organization. I was also very fortunate to have a supportive and encouraging boss, direct reports, colleagues, family and friends throughout the program. In a sense, we all signed up for the EMSL program through me and we all benefitted. Q: How has the EMSL advanced your career? A: In so many ways, I think that the EMSL program clarified and validated that I was on the right career path. My EMSL faculty mentors and fellow cohort members reinforced that for all of the twists and turns that led to this professional point in time, it was these experiences that provided an incredible foundation of resilience. Just as the ASU video referenced above articulated that every single thing we do can fall under the umbrella of sustainability, the EMSL program helped to clarify that every single part of our diverse backgrounds and experiences can help to make us more resilient, that the risks we take and the failures we experience are essential to achieving personal and professional success. The EMSL program also gave me the rigorous immersive experience of understanding and developing a true professional sustainability mindset, while simultaneously providing me with a phenomenal network of sustainability colleagues, mentors and experts, as well as resources, to continuously support my personal and professional growth in the future. Q: What does sustainability and sustainability leadership mean to you? A: For me, sustainability is a mindset. Sustainability is the idea that every single choice, decision, action and connection has a significantly greater positive impact when analyzed from the framework of “people, place and planet,” from an intentional and comprehensive “environmental, social and economic” approach. Sustainability leadership enables and requires us to lead by example and not exception, to focus on systems thinking, to empower others to develop and utilize their expertise, to build collaborative teams based on trust, open communication and mutual respect and accountability, to develop and tell our clear and compelling stories and to continuously measure our results, adjusting our strategy accordingly. The EMSL program empowers its students with an in-depth theoretical understanding of sustainability and a practical comprehensive skill set critical to successful sustainability leadership. EMSL graduates know that through a sustainability leadership mindset we can embrace positive change and solve local and global problems previously thought to be insurmountable. A: There isn’t a week that goes by that I don’t receive news and information from the ASU School of Sustainability, the EMSL program and my fellow EMSL cohort members and alumni that inspires me to continue our sustainability journey together. I am so grateful for the EMSL program and the remarkable people and work that it continues to produce. It is an honor and privilege to be part of such an inclusive and diverse organization, program and network of committed sustainability leaders. Thank you!